Hello all. I keep talking about how embroidery and weaving are some of the most ancient arts of mankind. We have little direct evidence, because textiles do not last in the same way that metalwork or pottery do. We do have some indirect evidence in the form of imprints of woven materials on pottery. Another indirect form of evidence is how widespread particular techniques are. Today i will focus on darning stitch embroidery, in Ukrainian called nyz or nyzynka. In darning stitch, one moves the needle up and down across the cloth, moving all the way across the design, imitating a shuttle. You will see that designs from many different places are similar because this technique develops diagonal lines, which result in diamonds, spurs, hooks, crosses, and similar motifs. The designs develop from the constraints of the technique. Here is the oldest piece that i have access to. This is part of a sampler from 15th century Egypt. 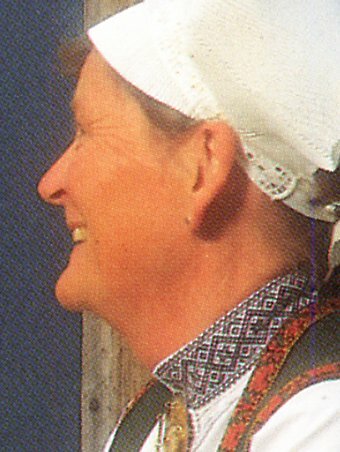 This woman is from Ullensvang in Norway. Note the embroidery on her collar, cuffs, and apron. 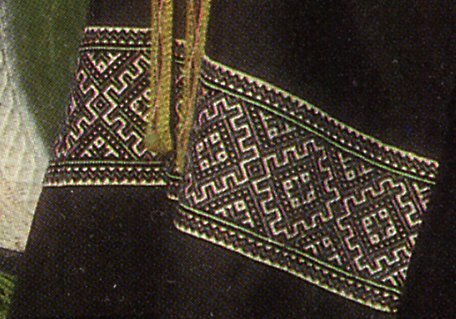 This piece of embroidery is from the Dalmatian Mountains in Croatia. 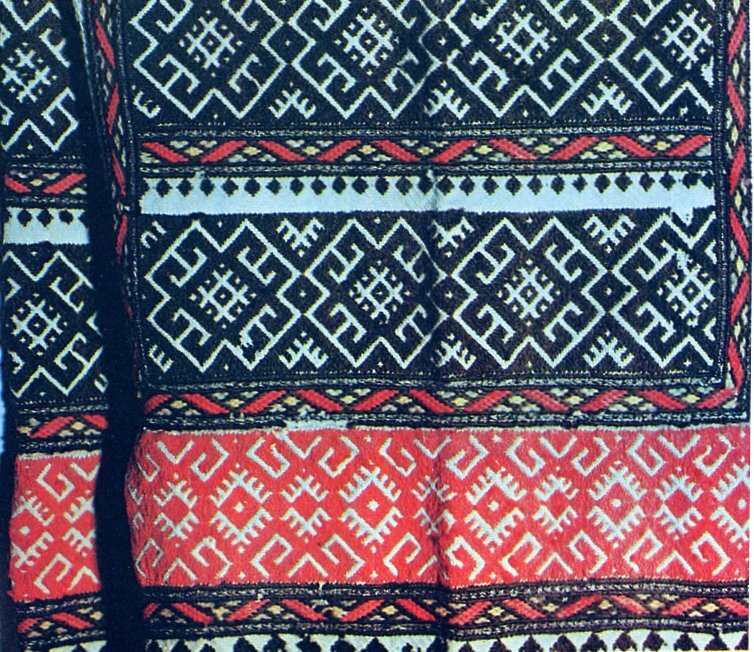 This embroidery is used on the sleeves of both women's chemises and mens shirts in the Voronezh Province of Russia. The people of this area claim to be descended from the Polovtsy, a steppe tribe that migrated out of the east. 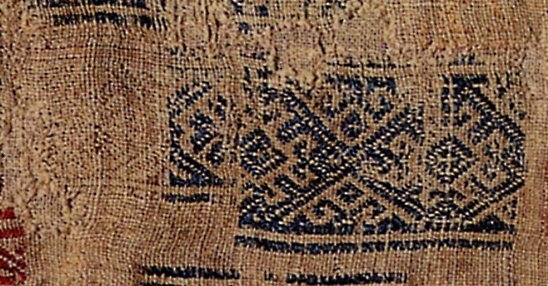 This is embroidery from the shoulder piece [inset] of a woman's chemise from Olonets [Russian] or Aunus [Finnish] Province,in the borderlands between Russia and Finland. 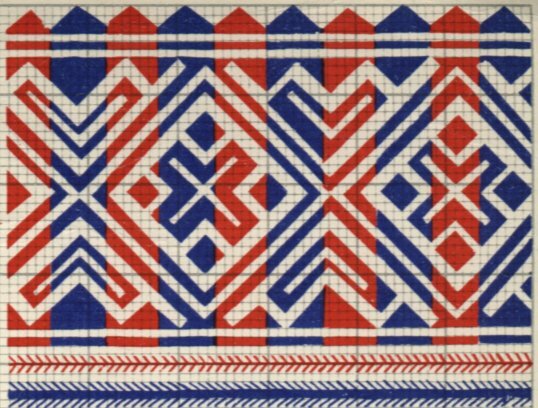 Here is a graph of a piece of embroidery from a woman's chemise of the southern Khanty people in Western Siberia. This embroider is from the lower part of a pair of trousers worn by a woman of the Mien [Yao] people of the hills of southwest China and Thailand. They are famous for their embroidery, as are their close relatives, the Hmong [Miao]. 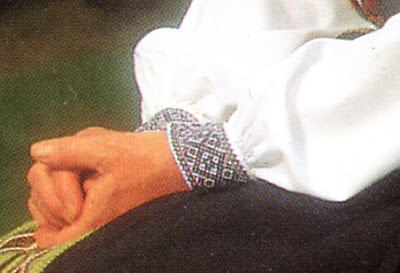 Instead of embroidering in black on white, they embroidery in white and other colors on black or indigo. 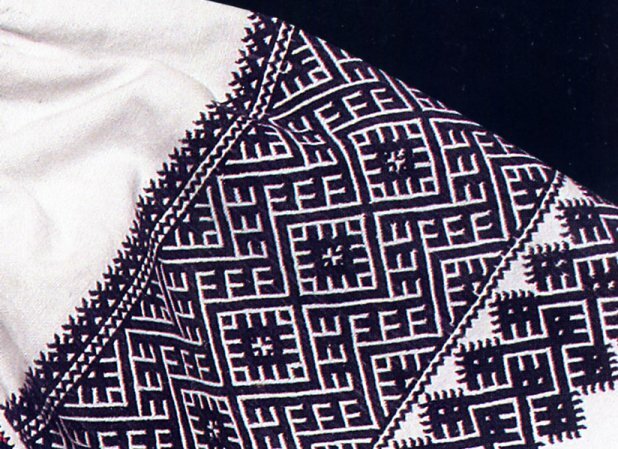 This is the embroidery on the shoulder/upper sleeve of a woman's chemise from East Podillia, Kryhopil' county, Vinnytsia Oblast in Ukraine. 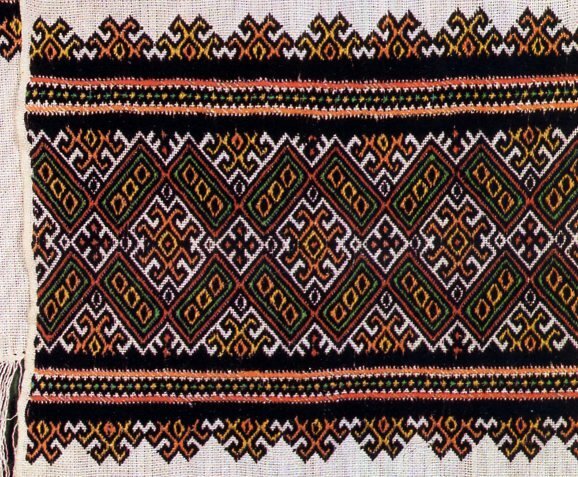 Here is a chart of a piece of embroidery from the shoulder piece, ustawka of a woman's chemise in the Boiko region, around the town of Turka, Ukraine. 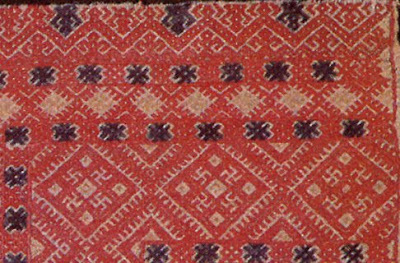 This is embroidery from the Pokuttia region, in the lowlands between the Carpathians and the Dnister River, in Ukraine. And of course we have to include an example from the Hutsul Region. I make no claim that this presentation is comprehensive. I am sure that there are other peoples and regions that also use this embroidery technique. 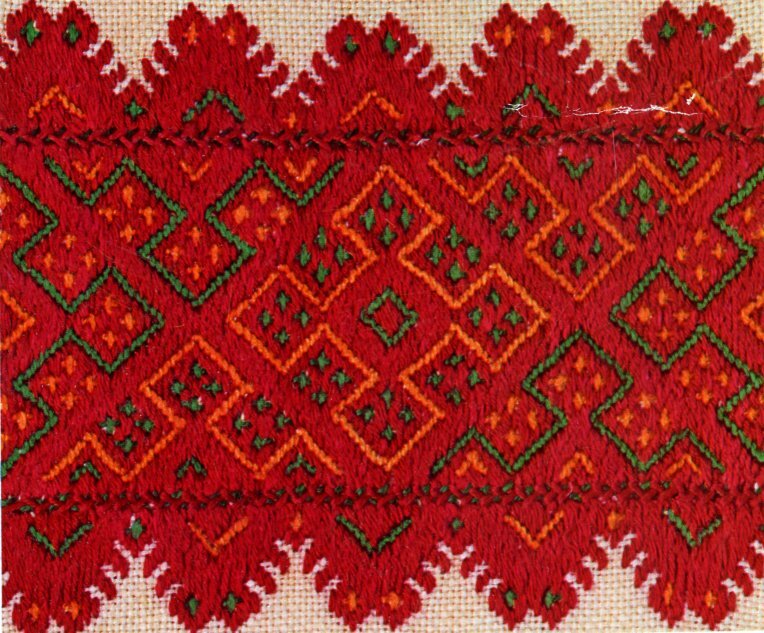 This is not proof of some genetic connection between these various peoples, but rather of the ancientness of this embroidery technique. It has had thousands of years to spread. I hope that you have found this interesting and inspiring. Let us not settle for wearing what the fashion industry cranks out for us, but instead make something that continues the tradition of surrounding ourselves with things of beauty and self expression.